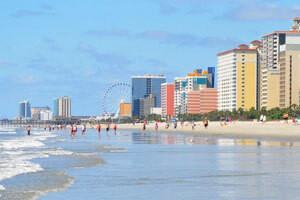 You're still in central Myrtle Beach, but outside the crowded strip. Head over to the beachside cabana across the street. For a delicious family meal or drink, hit up the resort's seasonal restaurant. Winter, spring, summer, or fall, the lazy river and pool are always open. During the summer months the lazy river faces the ocean, and in winter it's covered by a glass gallery. Don't let the cold interrupt your swim plans – there's an indoor pool. Grab a drink and casual meal at Buckets Bar and Grill. Away from all the crowds of the main drag, but still in central Myrtle Beach, Forest Dunes is a rental resort right across from the beach. During the hot summer months, hang out by the outdoor pool. Little ones will love the children’s pool. Take advantage of the indoor pool or float down the covered lazy river in the off-season. Whatever time of the year you come to Myrtle Beach, this family resort provides. Forest Dunes has a seaside fitness trail that is perfect for a run or stroll along the ocean. On the beach, you’ll find a cabana where you can change, shower, or lounge. And when it's time for dinner, check out the resort’s Buckets Bar & Grill, open seasonally. Spacious one-bedroom condos sleep four guests and feature balconies with breathtaking views. Full kitchens give you the freedom to make your meals. The resort is just a short drive to Walmart for groceries, bring the family along to help carry bags. Back in your condo, bake up a batch of your famous chocolate-chip cookies and let your junior bakers assist. Don’t worry if they end up covered in chocolate and flour; there is an on-site coin-operated laundry facility. Flat screen TVs with cable and DVD players provide entertainment. Be sure to pack favorite movies from home, gather everyone on the couch and enjoy the cookies during your family movie night. Broadway at the Beach features a variety of shops and restaurants that the whole family will love. Surprise the kids with a stop at Build-a-Bear where they can create a stuffed animal. Design a pair of flip-flops at the Flip Flop Factory. Forget to pack your sunglasses? No problem! Broadway at the Beach has three Sunglass Hut locations. Create your unique piece of jewelry at Pick a Pearl. Hungry? Dine at Joe’s Crab Shack, Jimmy Buffet’s Margaritaville, Johnny Rockets or Hard Rock Cafe. Take a family field trip to the Children’s Museum of Myrtle Beach. Little ones will enjoy the interactive exhibits that allow them to use their imaginations. They can be a bank teller or customer at The Big Bank, a contractor at the Under Construction House, a newscaster at the Weather Center or a paleontologist at the South Carolina Fossil House. They’ll have so much fun that they won’t even realize it’s educational! Take a ride on the SkyWheel. It’s almost two-hundred feet-tall and provides the best views of Myrtle Beach. The climate-controlled gondolas ensure that everyone in the family can ride in comfort. Please note: Motorcycles are not permitted at this resort. Cash deposits of $100 are required at check-in for those paying cash. Security deposits will be returned at check-out. Any guests checking out overnight will have their deposits mailed back.